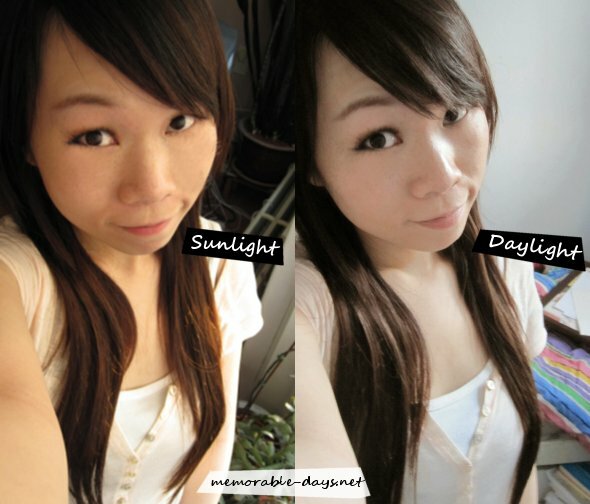 Review: Hair Extensions from Hairextensionsnow | Memorable Days : Beauty Blog - Korean Beauty, European, American Product Reviews. I recently got mailed by Alexandra, the marketing manager of Hairextensionsnow.com to review some hair extensions from their shop. 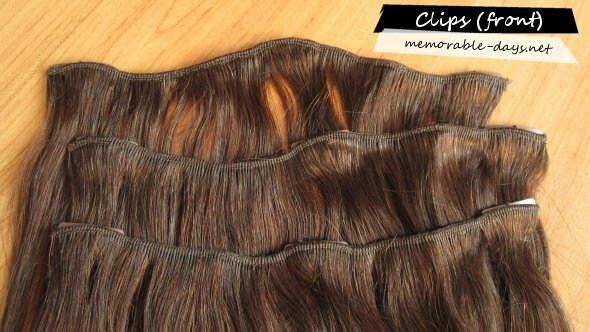 Hairextensionsnow is an online store based in the UK which sells hair extensions of the brand Clipinz®. You can find a large range of products at their store at low prices and free delivery on ALL items ^__^! As y’ll know I recently went to the hair salon to cut my hair. I wasn't very pleased with the outcome and I’m missing my long hair =(, so this is the best solution to get long hair again \^o^/. I was very excited to try these out since I had never tried hair extensions before. ALERT: Picture heavy and heaps of camwhoring pictures lol XD! They are shipping all products from the UK. I received the hair extensions in a week after they were shipped. 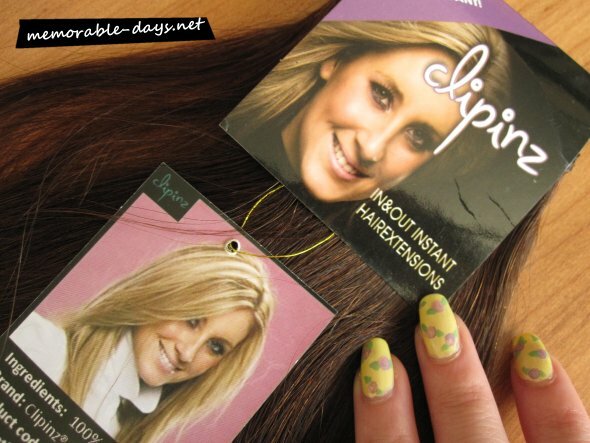 The hair extensions were sealed in a plastic packaging, very hygienic! Besides, it also came with a letter and a small book with more information about the brand, Clipinz® and their assortment. They normally sell these for £49.99 at hairextensionsnow.com. However, there is an easter special at the moment where you can get 25%- 35% off! Please visit their website for more information ;). I don't think it's expensive at all since they are selling it very expensive here in The Netherlands. As you can see, the clips are light brown. You won't be able to see those when you have the extensions on. A half head set comes with 3 pieces. Each piece has 3 clips and they will keep the hair extensions in place when worn. Overall Length 18" x Width 7.5". It's heat friendly, so you can straighten or curl it if you want to. These hair extensions can also be washed :). 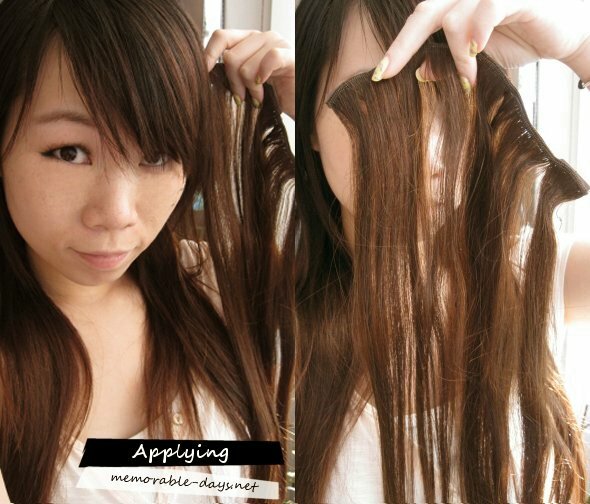 It's very easy to apply hair extensions. I applied the 3 pieces while watching the video below and I did it within 2 minutes ^__^. You can see in the pictures that it matches my own hair color perfectly, it looks like I'm pulling my own hair out haha scary~. My hair is very thin so I really needed these to add volume. Btw. I don't know why but I look kinda angry in this picture xD lol. You can't even see that I have hair extensions on since it matches my hair color and it has the same structure (it's thin). And NO I didn't photoshop any of these photo's! Can you find the differences =p ? It looks light brown in direct sunlight, but it is dark brown in daylight. I look like a ghost in the right picture, I'm so pale ahhh =[ !!! 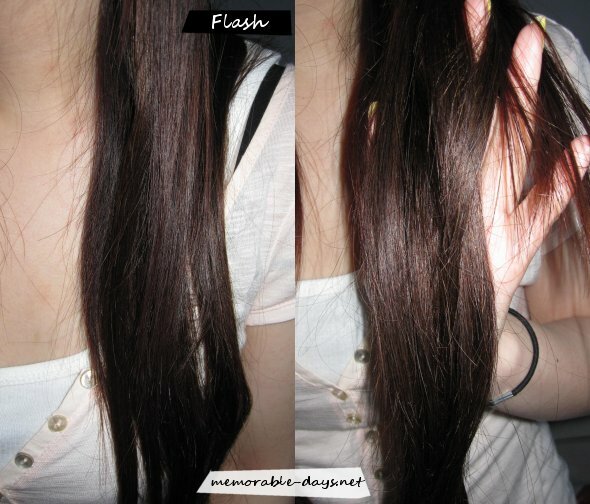 You usually can see the difference of the hair color when you use flash, but this time, you can't. After all of the camwhoring, it's finally time for my review! I first want to say: I LOVE IT! Really ^__^ LOVE IT! And I'm not saying this because it's sponsored, this is really my own opinion. The hair extensions are soft and it matches my hair color very well, it just blends in ^___^ which I like the most~ Nobody will notice that I'm wearing extensions ♥. 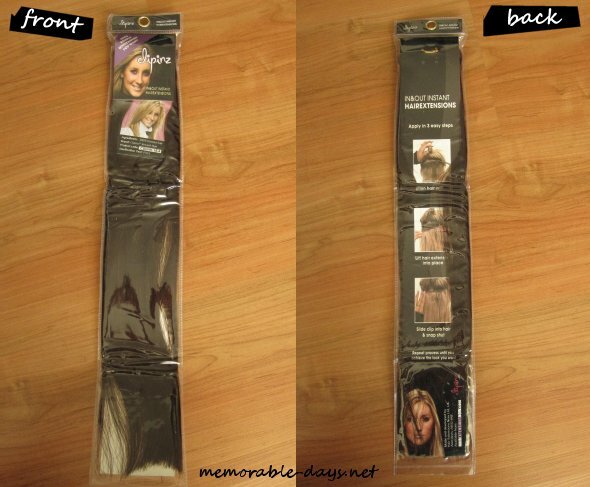 I can't compare it with any other kind of hair extensions since I only tried these. ♥ The shade matches my hair color perfectly and it will suit most Asians for sure! 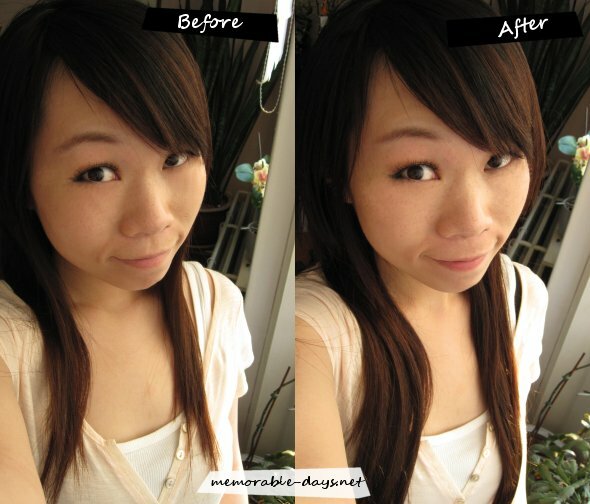 ♥ Thin structure, which is the same as my own hair and it's very smooth. I really can't think of any cons ^___^, it's just awesome! I'm very happy with the hair extensions and I will definitely wear these on a night out. Thank you Alexandra for sponsoring me the hair extensions. Visit their website: http://www.hairextensionsnow.com to see their whole collection and don't forget that they have an easter holiday special - which means 25% off! And you can get 10% off on your second purchase if you "LIKE" them on facebook. Yes, yes, yes that means that you can get 35% off in total with free shipping as well ^___^! 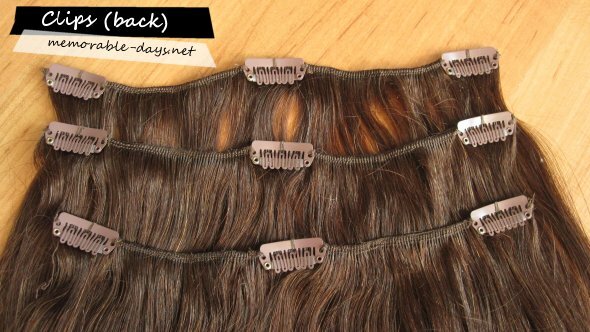 The hair extensions were send to me for review purposes, read the disclaimer for more information.